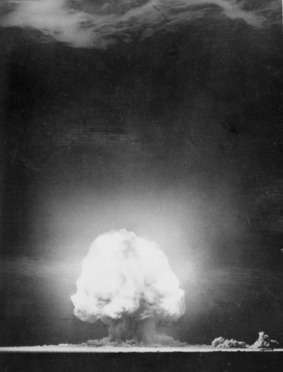 The Trinity explosion, which took place at New Mexico's White Sands Proving Ground on July 16, 1945, marked the beginning of the Atomic Age. Technology played a significant role in World War II. Some of the technologies used during the war were developed during the interwar years of the 1920s and 1930s, much was developed in response to needs and lessons learned during the war, while others were beginning to be developed as the war ended. Many wars had major effects on the technologies that we use in our daily lives. However, compared to previous wars, World War II had the greatest effect on the technology and devices that are used today. Technology also played a greater role in the conduct of World War II than in any other war in history, and had a critical role in its final outcome. World War II was the first war where military operations widely targeted the research efforts of the enemy. This included the exfiltration of Niels Bohr from German-occupied Denmark to Britain in 1943; the sabotage of Norwegian heavy water production; and the bombing of Peenemunde. Military operations were also conducted to obtain intelligence on the enemy's technology; for example, the Bruneval Raid for German radar and Operation Most III for the German V-2. In August, 1919 the British Ten Year Rule declared the government should not expect another war within ten years. Consequently, they conducted very little military R & D. In contrast, Germany and the Soviet Union were dissatisfied powers who, for different reasons, cooperated with each other on military R & D. The Soviets offered Weimar Germany facilities deep inside the USSR for building and testing arms and for military training, well away from Treaty inspectors' eyes. In return, they asked for access to German technical developments, and for assistance in creating a Red Army General Staff. The great artillery manufacturer Krupp was soon active in the south of the USSR, near Rostov-on-Don. In 1925, a flying school was established at Vivupal, near Lipetsk, to train the first pilots for the future Luftwaffe. Since 1926, the Reichswehr had been able to use a tank school at Kazan (codenamed Kama) and a chemical weapons facility in Samara Oblast (codenamed Tomka). In turn, the Red Army gained access to these training facilities, as well as military technology and theory from Weimar Germany. In the late 1920s, Germany helped Soviet industry begin to modernize, and to assist in the establishment of tank production facilities at the Leningrad Bolshevik Factory and the Kharkov Locomotive Factory. This cooperation would break down when Hitler rose to power in 1933. The failure of the World Disarmament Conference marked the beginnings of the arms race leading to war. In France the lesson of World War I was translated into the Maginot Line which was supposed to hold a line at the border with Germany. The Maginot Line did achieve its political objective of ensuring that any German invasion had to go through Belgium ensuring that France would have Britain as a military ally. France and Russia had more, and much better, tanks than Germany as of the outbreak of their hostilities in 1940. As in World War I, the French generals expected that armour would mostly serve to help infantry break the static trench lines and storm machine gun nests. They thus spread the armour among their infantry divisions, ignoring the new German doctrine of blitzkrieg based on the fast movement using concentrated armour attacks, against which there was no effective defense but mobile anti-tank guns - infantry Antitank rifles not being effective against medium and heavy tanks. Air power was a major concern of Germany and Britain between the wars. Trade in aircraft engines continued, with Britain selling hundreds of its best to German firms - which used them in a first generation of aircraft, and then improved on them much for use in German aircraft. These new inventions lead the way to major success for the Germans in World War II. Germany had always been and has continued to be in the forefront of internal combustion engine development. Göttingen was the world center of aerodynamics and fluid dynamics in general, at least up to the time when the highly dogmatic Nazi party came to power. This contributed to the German development of jet aircraft and of submarines with improved under-water performance. Induced nuclear fission was discovered in Germany in 1939 by Otto Hahn (and expatriate Jews in Sweden), but many of the scientists needed to develop nuclear power had already been lost, due to anti-Jewish and anti-intellectual policies. Scientists have been at the heart of warfare and their contributions have often been decisive. As Ian Jacob, the wartime military secretary of Winston Churchill, famously remarked on the influx of refugee scientists (including 19 Nobel laureates), "the Allies won the [Second World] War because our German scientists were better than their German scientists”. The Allies of World War II cooperated extensively in the development and manufacture of new and existing technologies to support military operations and intelligence gathering during the Second World War. There are various ways in which the allies cooperated, including the American Lend-Lease scheme and hybrid weapons such as the Sherman Firefly as well as the American-led Manhattan Project. Several technologies invented in Britain proved critical to the military and were widely manufactured by the Allies during the Second World War. The origin of the cooperation stemmed from a 1940 visit by the Aeronautical Research Committee chairman Henry Tizard that arranged to transfer U.K. military technology to the U.S. in case of the successful invasion of the U.K. that Hitler was planning as Operation Sea Lion. Tizard led a British technical mission, known as the Tizard Mission, containing details and examples of British technological developments in fields such as radar, jet propulsion and also the early British research into the atomic bomb. One of the devices brought to the U.S. by the Mission, the resonant cavity magnetron, was later described as "the most valuable cargo ever brought to our shores". Military weapons technology experienced rapid advances during World War II, and over six years there was a disorientating rate of change in combat in everything from aircraft to small arms. Indeed, the war began with most armies utilizing technology that had changed little from World War I, and in some cases, had remained unchanged since the 19th century. For instance cavalry, trenches, and World War I-era battleships were normal in 1940, however within only six years, armies around the world had developed jet aircraft, ballistic missiles, and even atomic weapons in the case of the United States. The best jet fighters at the end of the war easily outflew any of the leading aircraft of 1939, such as the Spitfire Mark I. The early war bombers that caused such carnage would almost all have been shot down in 1945, many by radar-aimed, proximity fuse-detonated anti-aircraft fire, just as the 1941 "invincible fighter", the Zero, had by 1944 become the "turkey" of the "Marianas Turkey Shoot". The best late-war tanks, such as the Soviet JS-3 heavy tank or the German Panther medium tank, handily outclassed the best tanks of 1939 such as Panzer IIIs. In the navy the battleship, long seen as the dominant element of sea power, was displaced by the greater range and striking power of the aircraft carrier. The chaotic importance of amphibious landings stimulated the Western Allies to develop the Higgins boat, a primary troop landing craft; the DUKW, a six-wheel-drive amphibious truck, amphibious tanks to enable beach landing attacks and Landing Ship, Tanks to land tanks on beaches. Increased organization and coordination of amphibious assaults coupled with the resources necessary to sustain them caused the complexity of planning to increase by orders of magnitude, thus requiring formal systematization giving rise to what has become the modern management methodology of project management by which almost all modern engineering, construction and software developments are organized. In the Western European Theatre of World War II, air power became crucial throughout the war, both in tactical and strategic operations (respectively, battlefield and long-range). Superior German aircraft, aided by ongoing introduction of design and technology innovations, allowed the German armies to overrun Western Europe with great speed in 1940, largely assisted by lack of Allied aircraft, which in any case lagged in design and technical development during the slump in research investment after the Great Depression. Since the end of World War I, the French Air Force had been badly neglected, as military leaders preferred to spend money on ground armies and static fortifications to fight another World War I-style war. As a result, by 1940, the French Air Force had only 1562 planes and was together with 1070 RAF planes facing 5,638 Luftwaffe fighters and fighter-bombers. Most French airfields were located in north-east France, and were quickly overrun in the early stages of the campaign. The Royal Air Force of the United Kingdom possessed some very advanced fighter planes, such as Spitfires and Hurricanes, but these were not useful for attacking ground troops on a battlefield, and the small number of planes dispatched to France with the British Expeditionary Force were destroyed fairly quickly. Subsequently, the Luftwaffe was able to achieve air superiority over France in 1940, giving the German military an immense advantage in terms of reconnaissance and intelligence. German aircraft rapidly achieved air superiority over France in early 1940, allowing the Luftwaffe to begin a campaign of strategic bombing against British cities. Utilizing France's airfields near the English Channel the Germans were able to launch raids on London and other cities during the Blitz, with varying degrees of success. After World War I, the concept of massed aerial bombing—"The bomber will always get through"—had become very popular with politicians and military leaders seeking an alternative to the carnage of trench warfare, and as a result, the air forces of Britain, France, and Germany had developed fleets of bomber planes to enable this (France's bomber wing was severely neglected, whilst Germany's bombers were developed in secret as they were explicitly forbidden by the Treaty of Versailles). The bombing of Shanghai by the Imperial Japanese Navy on January 28, 1932, and August 1937 and the bombings during the Spanish Civil War (1936–1939), had demonstrated the power of strategic bombing, and so air forces in Europe and the United States came to view bomber aircraft as extremely powerful weapons which, in theory, could bomb an enemy nation into submission on their own. As a result, the fear of bombers triggered major developments in aircraft technology. Nazi Germany had put only one large, long-range strategic bomber (the Heinkel He 177 Greif, with many delays and problems) into production, while the America Bomber concept resulted only in prototypes. The Spanish Civil War had proved that tactical dive-bombing using Stukas was a very efficient way of destroying enemy troops concentrations, and so resources and money had been devoted to the development of smaller bomber craft. As a result, the Luftwaffe was forced to attack London in 1940 with heavily overloaded Heinkel and Dornier medium bombers, and even with the unsuitable Junkers Ju 87. These bombers were painfully slow—Italian engineers had been unable to develop sufficiently large piston aircraft engines (those that were produced tended to explode through extreme overheating), and so the bombers used for the Battle of Britain were woefully undersized. As German bombers had not been designed for long-range strategic missions, they lacked sufficient defenses. The Messerschmitt Bf 109 fighter escorts had not been equipped to carry enough fuel to guard the bombers on both the outbound and return journeys, and the longer-range Bf 110s could be outmanoeuvred by the short-range British fighters. (A bizarre feature of the war was how long it took to conceive of the Drop tank.) The air defense was well organized and equipped with effective radar that survived the bombing. As a result, German bombers were shot down in large numbers, and were unable to inflict enough damage on cities and military-industrial targets to force Britain out of the war in 1940 or to prepare for the planned invasion. British long-range bomber planes such as the Short Stirling had been designed before 1939 for strategic flights and given a large armament, but their technology still suffered from numerous flaws. The smaller and shorter ranged Bristol Blenheim, the RAF's most-used bomber, was defended by only one hydraulically operated machine-gun turret, and whilst this appeared sufficient, it was soon revealed that the turret was a pathetic defence against squadrons of German fighter planes. American bomber planes such as the B-17 Flying Fortress had been built before the war as the only adequate long-range bombers in the world, designed to patrol the long American coastlines. Defended by as many as six machine-gun turrets providing 360° cover, the B-17s were still vulnerable without fighter protection even when used in large formations. Despite the abilities of Allied bombers, though, Germany was not quickly crippled by Allied air raids. At the start of the war the vast majority of bombs fell miles from their targets, as poor navigation technology ensured that Allied airmen frequently could not find their targets at night. The bombs used by the Allies were very high-tech devices, and mass production meant that the precision bombs were often made sloppily and so failed to explode. German industrial production actually rose continuously from 1940 to 1945, despite the best efforts of the Allied air forces to cripple industry. Significantly, the bomber offensive kept the revolutionary Type XXI U-Boat from entering service during the war. Moreover, Allied air raids had a serious propaganda impact on the German government, all prompting Germany to begin serious development on air defence technology—in the form of fighter planes. The practical jet aircraft age began just before the start of the war with the development of the Heinkel He 178, the first true turbojet. Late in the war the Germans brought in the first operational Jet fighter, the Messerschmitt Me 262. However, despite their seeming technological edge, German jets were often hampered by technical problems, such as short engine lives, with the Me 262 having an estimated operating life of just ten hours before failing. German jets were also overwhelmed by Allied air superiority, frequently being destroyed on or near the airstrip. Other jet aircraft, such as the first and only Allied jet fighter of the war, the British Gloster Meteor, saw combat against German V-1 flying bombs but did not significantly distinguish themselves from top-line, late-war piston-driven aircraft. Aircraft saw rapid and broad development during the war to meet the demands of aerial combat and address lessons learned from combat experience. From the open cockpit airplane to the sleek jet fighter, many different types were employed, often designed for very specific missions. Aircraft were used in anti-submarine warfare against German U-Boats, by the Germans to mine shipping lanes and by the Japanese against previously formidable Royal Navy battleships such as HMS Prince of Wales (53). During the war the Germans produced various Glide bomb weapons, which were the first smart bombs; the V-1 flying bomb, which was the first cruise missile weapon; and the V-2 rocket, the first ballistic missile weapon. The last of these was the first step into the space age as its trajectory took it through the stratosphere, higher and faster than any aircraft. This later led to the development of the Intercontinental ballistic missile (ICBM). Wernher Von Braun led the V-2 development team and later emigrated to the United States where he contributed to the development of the Saturn V rocket, which took men to the moon in 1969. The laboratory of Ludwig Prandtl at University of Göttingen was the main center of theoretical and mathematical aerodynamics and fluid dynamics research from soon after 1904 to the end of World War II. Prandtl coined the term boundary layer and founded modern (mathematical) aerodynamics. The laboratory lost its dominance when the researchers were dispersed after the war. The Axis countries had serious shortages of petroleum from which to make liquid fuel. The Allies had much more petroleum production. Germany, long before the war, developed a process to make synthetic fuel from coal. Synthesis factories were principal targets of the Oil Campaign of World War II. The USA added tetra ethyl lead to its aviation fuel, with which it supplied Britain and other Allies. This octane enhancing additive allowed higher compression ratios, allowing higher efficiency, giving more speed and range to Allied Airplanes, and reducing the cooling load. The Treaty of Versailles had imposed severe restrictions upon Germany constructing vehicles for military purposes, and so throughout the 1920s and 1930s, German arms manufacturers and the Wehrmacht had begun secretly developing tanks. As these vehicles were produced in secret, their technical specifications and battlefield potentials were largely unknown to the European Allies until the war actually began. When German troops invaded the Benelux nations and France in May 1940, German weapons technology proved to be immeasurably superior to that of the Allies. The French Army suffered from serious technical deficiencies with its tanks. In 1918, France's Renault FT had been the most advanced in the world; although small, capable of far outperforming their slow and clumsy British, German, or American counterparts. However, this superiority resulted in tank development stagnating after World War I. By 1939, French tanks were virtually unchanged from 1918. French and British Generals believed that a future war with Germany would be fought under very similar conditions as those of 1914–1918. Both invested in thickly armoured, heavily armed vehicles designed to cross shell-damaged ground and trenches under fire. At the same time the British also developed faster but lightly armoured Cruiser tanks to range behind the enemy lines. In contrast, the Wehrmacht invested in fast, light tanks designed to overtake infantry. These vehicles would vastly outperform British and French tanks in mechanized battles. German tanks followed the design of France's 1918 Renault versions—a moderately armoured hull with a rotating turret on top mounting a cannon. This gave every German tank the potential to engage other armoured vehicles. In contrast, around 35% of French tanks were simply equipped with machine guns (again designed for trench warfare), meaning that when French and German met in battle, a third of the French assault vehicles would not be able to engage enemy tanks, their machine-gun fire only ricocheting off German armour plates. Only a handful of French tanks had radios, and these often broke as the tank lurched over uneven ground. German tanks were, on the contrary, all equipped with radios, allowing them to communicate with one another throughout battles, whilst French tank commanders could rarely contact other vehicles. The Matilda Mk I tanks of the British Army were also designed for infantry support and were protected by thick armour. This was ideal for trench warfare, but made the tanks painfully slow in open battles. Their light cannons and machine-guns were usually unable to inflict serious damage on German vehicles. The exposed caterpillar tracks were easily broken by gunfire, and the Matilda tanks had a tendency to incinerate their crews if hit, as the petrol tanks were located on the top of the hull. By contrast the Infantry tank Matilda II fielded in lesser numbers was largely invulnerable to German gunfire and its gun was able to punch through the German tanks. However French and British tanks were at a disadvantage compared to the air supported German armoured assaults, and a lack of armoured support contributed significantly to the rapid Allied collapse in 1940. World War II marked the first full-scale war where mechanization played a significant role. Most nations did not begin the war equipped for this. Even the vaunted German Panzer forces relied heavily on non-motorised support and flank units in large operations. While Germany recognized and demonstrated the value of concentrated use of mechanized forces, they never had these units in enough quantity to supplant traditional units. However, the British also saw the value in mechanization. For them it was a way to enhance an otherwise limited manpower reserve. America as well sought to create a mechanized army. For the United States, it was not so much a matter of limited troops, but instead a strong industrial base that could afford such equipment on a great scale. The most visible vehicles of the war were the tanks, forming the armored spearhead of mechanized warfare. Their impressive firepower and armor made them the premier fighting machine of ground warfare. However, the large number of trucks and lighter vehicles that kept the infantry, artillery, and others moving were massive undertakings also. Naval warfare changed dramatically during World War II, with the ascent of the aircraft carrier to the premier vessel of the fleet, and the impact of increasingly capable submarines on the course of the war. The development of new ships during the war was somewhat limited due to the protracted time period needed for production, but important developments were often retrofitted to older vessels. Advanced German submarine types came into service too late and after nearly all the experienced crews had been lost. In addition to aircraft carriers, its assisting counterpart of destroyers were advanced as well. From the Imperial Japanese Navy, the Fubuki-class destroyer was introduced. The Fubuki class set a new standard not only for Japanese vessels, but for destroyers around the world. At a time when British and American destroyers had changed little from their un-turreted, single-gun mounts and light weaponry, the Japanese destroyers were bigger, more powerfully armed, and faster than any similar class of vessel in the other fleets. The Japanese destroyers of World War II are said to be the world's first modern destroyer. The German U-boats were used primarily for stopping/destroying the resources from the United States and Canada coming across the Atlantic. Submarines were critical in the Pacific Ocean as well as in the Atlantic Ocean. Advances in submarine technology included the snorkel. Japanese defenses against Allied submarines were ineffective. Much of the merchant fleet of the Empire of Japan, needed to supply its scattered forces and bring supplies such as petroleum and food back to the Japanese Archipelago, was sunk. Among the warships sunk by submarines was the war's largest aircraft carrier, the Shinano. The Kriegsmarine introduced the pocket battleship to get around constraints imposed by the Treaty of Versailes. Innovations included the use of diesel engines, and welded rather than riveted hulls. The most important shipboard advances were in the field of anti-submarine warfare. Driven by the desperate necessity of keeping Britain supplied, technologies for the detection and destruction of submarines was advanced at high priority. The use of ASDIC (SONAR) became widespread and so did the installation of shipboard and airborne radar. The Allies Ultra code breaking allowed convoys to be steered around German U-Boat wolfpacks. The actual weapons; the guns, mortars, artillery, bombs, and other devices, were as diverse as the participants and objectives. A large array were developed during the war to meet specific needs that arose, but many traced their early development to prior to World War II. Torpedoes began to use magnetic detonators; compass-directed, programmed and even acoustic guidance systems; and improved propulsion. Fire-control systems continued to develop for ships' guns and came into use for torpedoes and anti-aircraft fire. Human torpedoes and the Hedgehog were also developed. Missiles: The Pulse jet-powered V-1 flying bomb was the world's first cruise missile, Rockets progressed enormously: V-2 rocket, Katyusha rocket artillery and air-launched rockets. Specialised bombs: cluster bombs, blockbuster bombs, drum bombs and bunker busters. HEAT, and HESH anti-armour warheads. Proximity fuze for shells, bombs and rockets. This fuze is designed to detonate an explosive automatically when close enough to the target to destroy it, so a direct hit is not required and time/place of closest approach does not need to be estimated. Magnetic torpedoes and mines also had a sort of proximity fuse. Guided weapons (by radio or trailing wires): glide bombs, crawling bombs and rockets - the precursors of today's precision-guided munitions existed between 1942–45, in the German Fritz X and Henschel Hs 293 anti-ship ordnance designs, which along with the American Azon, were all MCLOS radio-guided ordnance designs in World War II service. Self-guiding weapons: torpedoes (sound-seeking, compass-guided and looping), V1 missile (compass- and timer-guided), and the U.S. Navy's Bat air-launched anti-ship glide ordnance, using active radar homing for the first time anywhere. Aiming devices for bombs, torpedoes, artillery and machine guns, using special purpose mechanical and electronic analog and (perhaps) digital "computers". The mechanical analog Norden bomb sight is a well-known example. New production methods for weapons such as stamping, riveting, and welding came into being to produce the number of arms needed. Design and production methods had advanced enough to manufacture weapons of reasonable reliability such as the PPSh-41, PPS-42, Sten, Beretta Model 38, MP 40, M3 Grease Gun, Gewehr 43, Thompson submachine gun and the M1 Garand rifle. Other Weapons commonly found During World War II include the American, Browning Automatic Rifle (BAR), M1 Carbine Rifle, as well as the Colt M1911 A-1; The Japanese Type 11 the Type 96 machine gun, and the Arisaka bolt-action rifles all were significant weapons used during the war. World War II saw the establishment of the reliable semi-automatic rifle, such as the American M1 Garand and, more importantly, of the first widely used assault rifles, named after the German sturmgewehrs of the late war. Earlier renditions that hinted at this idea were that of the employment of the Browning Automatic Rifle and 1916 Fedorov Avtomat in a walking fire tactic in which men would advance on the enemy position showering it with a hail of lead. The Germans first developed the FG 42 for its paratroopers in the assault and later the Sturmgewehr 44 (StG 44), the world's first assault rifle, firing an intermediate cartridge; the FG 42's use of a full-powered rifle cartridge made it difficult to control. Developments in machine gun technology culminated in the Maschinengewehr 42 (MG42) which was of an advanced design unmatched at the time. It spurred post-war development on both sides of the upcoming Cold War and is still used by some armies to this day including the German Bundeswehr's MG 3. The Heckler & Koch G3, and many other Heckler & Koch designs, came from its system of operation. The United States military meshed the operating system of the FG 42 with the belt feed system of the MG42 to create the M60 machine gun used in the Vietnam War. Despite being overshadowed by self-loading/automatic rifles and sub-machine guns, bolt-action rifles remained the mainstay infantry weapon of many nations during World War II. When the United States entered World War II, there were not enough M1 Garand rifles available to American forces which forced the US to start producing more M1903 rifles in order to act as a "stop gap" measure until sufficient quantities of M1 Garands were produced. During the conflict, many new models of bolt-action rifles were produced as a result of lessons learned from the First World War with the designs of a number of bolt-action infantry rifles being modified in order to speed up production as well as to make the rifles more compact and easier to handle. Examples of bolt-action rifles that were used during World War II include the German Mauser Kar98k, the British Lee–Enfield No.4, and the Springfield M1903A3. During the course of World War II, bolt-action rifles and carbines were modified even further to meet new forms of warfare the armies of certain nations faced e.g. urban warfare and jungle warfare. Examples include the Soviet Mosin–Nagant M1944 carbine, which were developed by the Soviets as a result of the Red Army's experiences with urban warfare e.g. the Battle of Stalingrad, and the British Lee–Enfield No.5 carbine, that were developed for British and Commonwealth forces fighting the Japanese in South-East Asia and the Pacific. When World War II ended in 1945, the small arms that were used in the conflict still saw action in the hands of the armed forces of various nations and guerrilla movements during and after the Cold War era. Nations like the Soviet Union and the United States provided many surplus, World War II-era small arms to a number of nations and political movements during the Cold War era as a pretext to providing more modern infantry weapons. The massive research and development demands of the war included the Manhattan Project, the effort to quickly develop an atomic bomb, or nuclear fission warhead. It was perhaps the most profound military development of the war, and had a great impact on the scientific community, among other things creating a network of national laboratories in the United States. In 1942, and with the threat of invasion by Germany still apparent, the United Kingdom dispatched around 20 British scientists and technical staff to America, along with their work, which had been carried out under the codename Tube Alloys, to prevent the potential for vital information falling into enemy hands. The scientists formed the British contribution to the Manhattan Project, where their work on uranium enrichment was instrumental in jump-starting the project. The invention an atomic bomb meant that a single aircraft could carry a weapon sufficiently powerful to devastate entire cities, making conventional warfare against a nation with an arsenal of them suicidal. Following the conclusion of the European Theater in May 1945, two atomic bombs were then employed against the Empire of Japan in August during the Pacific Theater, effectively terminating the war, which averted the need for invading mainland Japan. The strategic importance of the bomb, and its even more powerful fusion-based successors, did not become fully apparent until the United States lost its monopoly on the weapon in the post-war era. The Soviet Union developed and tested their first nuclear weapon in 1949, based partially on information obtained from Soviet espionage in the United States. Nuclear competition between the two superpowers played a large part in the development of the Cold War. The strategic implications of such a massively destructive weapon still reverberate in the 21st century. There was also a German nuclear energy project, including talk of an atomic weapon. This failed for a variety of reasons, most notably German Antisemitism. Half of continental theoretical physicists including (Einstein, Bohr, Enrico Fermi, and Oppenheimer) who did much of their early study and research in Germany, were either Jewish or, in the case of Enrico Fermi, married to a Jew. Erwin Schrödinger had also left Germany for political reasons. When they left Germany, the only leading nuclear physicist left in Germany was Heisenberg, who apparently dragged his feet on the project, or at best lacked the high morale that characterized the Los Alamos work. He made some faulty calculations suggesting that the Germans would need significantly more heavy water than was necessary. Otto Hahn, the physical chemist who had the central part in the original discovery of fission, was another key figure in the project. The project was doomed due to insufficient resources. The Empire of Japan was also developing an atomic Bomb, however, it floundered due to lack of resources despite gaining interest from the government. The collaboration between the British and the Americans led to the 1958 US-UK Mutual Defence Agreement between the two nations, whereby American nuclear weapons technology was adapted for British use. Electronics rose to prominence quickly in World War II. The British developed and progressed electronic computers which were primarily used for breaking the “Enigma” codes, which were Nazi secret codes. These codes for radio messages were indecipherable to the Allies. However, the meticulous work of code breakers based at Britain’s Bletchley Park cracked the secrets of German wartime communication, and played a crucial role in the final defeat of Germany. Americans also used electronic computers for equations, such as battlefield equations, ballistics, and more. Numerous small digital computers were also used. From calculating tables, to mechanical trajectory calculators, to some of the most advanced electronic computers. Soldiers would usually carry most of the electronic devices in their pockets, but since technology has developed, digital computers started to increase in size, which spacious command and control centres would have. Initial control centers that were embarked on ships and aircraft that established the networked computing, is so essential to our daily lives. While prior to the war few electronic devices were seen as important pieces of equipment, by the middle of the war instruments such as radar and ASDIC (sonar) had become invaluable. Germany started the war ahead in some aspects of radar, but lost ground to work in England and to physicists and engineers at the "Radiation Laboratory" of the Massachusetts Institute of Technology. Half of the German theoretical physicists were Jewish and had emigrated or otherwise been lost to Germany long before WW II started. Equipment designed for communications and the interception of those communications became critical. The Germans widely relied on the Enigma coding machine for encrypting communications. The British developed a new method for decoding Enigma benefiting from information given to Britain by the Polish Cipher Bureau, which had been decoding early versions of Enigma before the war. The V-1, which is also known as the buzz bomb. This automatic aircraft is today known as a “cruise missile”. The V-1 was developed at Peenemünde Army Research Center by the Nazi German Luftwaffe during the Second World War. During initial development it was known by the codename "Cherry Stone". The first of the so-called Vergeltungswaffen series designed for terror bombing of London, the V-1 was fired from launch facilities along the French (Pas-de-Calais) and Dutch coasts. The first V-1 was launched at London on 13 June 1944), one week after (and prompted by) the successful Allied landings in Europe. At its peak, more than one hundred V-1s a day were fired at south-east England, 9,521 in total, decreasing in number as sites were overrun until October 1944, when the last V-1 site in range of Britain was overrun by Allied forces. After this, the V-1s were directed at the port of Antwerp and other targets in Belgium, with 2,448 V-1s being launched. The attacks stopped when the last launch site was overrun on 29 March 1945. The V-2 (German: Vergeltungswaffe 2, "Retribution Weapon 2"), technical name Aggregat-4 (A-4), was the world's first long-range guided ballistic missile. The missile with liquid-propellant rocket engine was developed during the Second World War in Germany as a "vengeance weapon", designed to attack Allied cities as retaliation for the Allied bombings against German cities. The V-2 rocket was also the first artificial object to cross the boundary of space. These two rocketry advances took the lives of many civilians in London during the years 1944 and 1945. After the war, many of the inventions created during World War II that were invented for the troops were later sold to the civilian population. During 1932, the creator of M&M's, Forrest Mars Sr. moved to England, after clashing enough times with his father, and began manufacturing Mars Bars for troops in the UK. It wasn't until the Spanish War where Forrest purportedly encountered troops eating small beads of chocolate that were encased in hard sugar shells, as Forrest was thrilled to share this new treat as most chocolate treats sold poorly during the summer. When he returned to the US, he approached Bernie Murrie, the son of a Hersey's executive, to join him in his business venture as he anticipated a demand of chocolate and sugar during the war. Patented in 1941, production of M&Ms began that year in a plant located in Newark, New Jersey. The candies were sold exclusively to the military when the US joined the war and were used as an easy way to provide the troops with chocolate on the battlefield without it melting so easily. After the war, many troops were hooked on the candies provided and in 1946, the candies again available for the civilian population. ↑ Roberts, Susan A.; Calvin A. Roberts (2006). New Mexico. University of New Mexico Press. ISBN 9780826340030. ↑ Dominic Selwood (29 January 2014). "The man who invented poison gas". The Telegraph. Retrieved 29 January 2014. ↑ "Jet Fighters: Inside & Out", Jim Winchester, 2012. ↑ "Meteor I vs V1 Flying Bomb", Nijboer, Donald. ↑ Parshall and Tully, Shattered Sword: The Untold Story of the Battle of Midway. p. 336. ↑ "Inventor of the Week: Archive". Web.mit.edu. 2005. Archived from the original on 10 March 2005. Retrieved 18 July 2016. Anderson, J. (2005). Ludwig Prandtl's boundary layer. Physics Today.